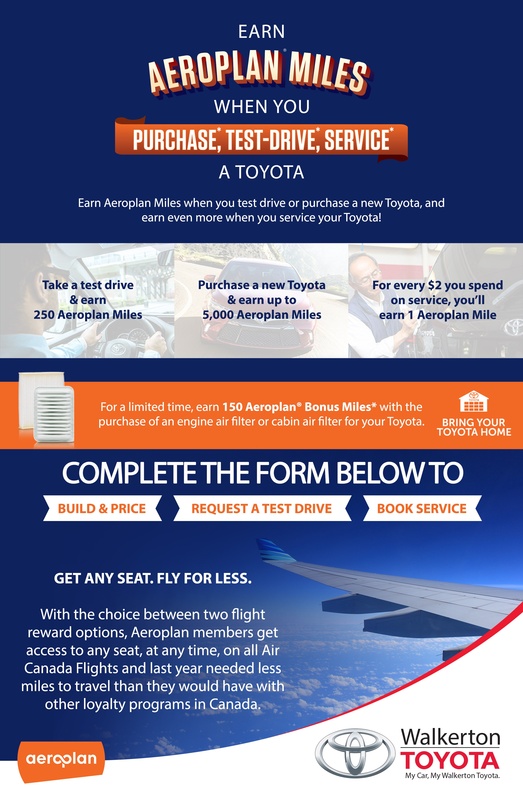 *Service: Service offer and 150 Bonus offer valid from July 1, 2017 to August 31, 2017, are applicable only to Toyota and Scion Vehicles, and only to customer paid Repair Orders at Canadian Toyota dealership service counter; excludes body shop services, no-Repair Order over-the-counter parts/accessory purchases, warranty/goodwill/ ECP/sub-let related services/parts/labour. Limit of 30 Repair Orders /30 day period. Applies to Repair Orders opened on or after July 1, 2017. For Service offer, Members will earn 1 mile per threshold of $2 spent. For example, Members will earn 24 miles for a purchase of $49.99. For 150 Bonus offer, Member will earn 150 miles upon purchase of an engine air filter or a cabin air filter. Customers must be an Aeroplan Member prior to the completion of the transaction. Offer subject to change without notice. Some conditions apply. See your Dealer for details. 1Based on a comparison of 2015 Aeroplan Flight Reward bookings against actual market base fares and other leading financial institutions’ proprietary travel rewards programs’ terms and conditions.